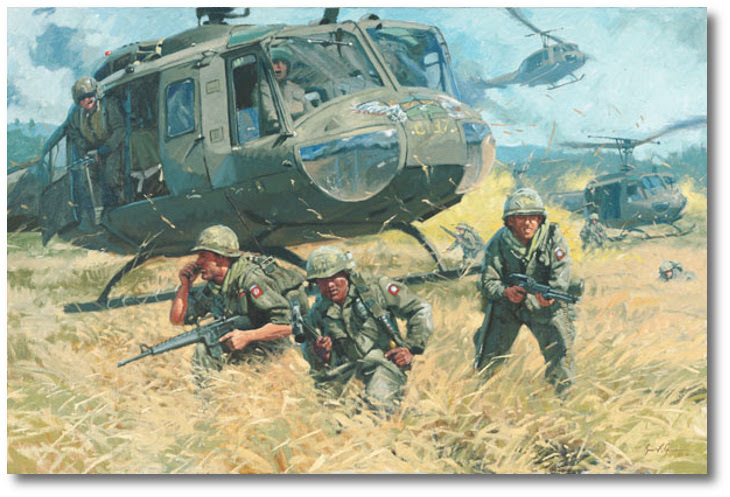 The story of the painting �In Contact� commissioned by the 3rd Brigade (Golden) of the 3rd Brigade in Vietnam began on February 12, 1968, when the 3rd Brigade was deployed to the Republic of Vietnam. 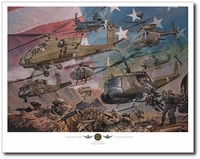 Many years after the Brigade returned its colors to Ft. Bragg, North Carolina, several of the troopers who served with the 3rd Brigade in Vietnam formed the Golden Brigade Chapter of the 82nd Airborne Division Association. The early troopers who spear headed the Chapter�s formation included Dave Stits, deceased, Carl Bludau and Richard O�Hare. Through their guidance, the Chapter grew and reunions of the 3rd Brigade were held commencing in the 1990�s. Starting with the first reunion, Chapter Members discussed commissioning a painting to commemorate the service of the3rd Brigade in Vietnam and therefore to preserve its history.